Sufjan's Super Christmas Show now on Online! FINALLY! The 90 minute parody show written by me and Nicky Martin (Botnik, Freakfest) is online! The show features dozens of Chicago’s funniest performers being Christmassy, musical, naughty, and nice. The show also features original content by The Shrimp Boys, Cameron Gillette, and Megan Stalter. New dates posted + stay tuned for more! So, I forgot to post all my shows for January, but I have some early confirmed dates for the rest of the winter and part of Spring! Soooooo there’s that! Thanks and hopefully see you at a show. Tonight is the debut of the Christmas variety/sketch show I wrote with Nicky Martin (Botnik, Freakfest), called Sufjan’s Super Christmas Show at the Hideout in Chicago. It’s sold out, but there will be tickets available at the door starting at 9pm. I’m playing Sufjan Stevens (which is a dream come true), and I am trying to raise Christmas cheer to save Santa from dying of cancer of the bone. And then things go off the rails. For those of you already with tickets, I hope you enjoy the show! Hey Missouri! Some weddings and an strong desire to see my family again is bringing me back home for a little bit! I've got four shows while I’m in the state, so check ‘em out! This weekend I was able to read an essay about #prisonstrike2018 live at The Paper Machete, a "live magazine" show in Chicago. You can read my essay about this under-reported event taking place HERE! Thanks! Check out my SHOWS page for my upcoming dates! There's some fun stuff happening throughout the rest of August, and there's some fun stuff soon to be announced for October (stay tuned, Missouri!). Hi there! How are you? Oh, that's good. Yeah, I'm alright. Thank you for asking! Here's some stuff I've been up recently, and some things I'll be up to soon! 1. I was interviewed by Voyage Chicago about cartooning, art in general, and whether or not I'm "thought provoking." Check it out HERE! 2. A couple months back, I was on one of my favorite podcasts, STAND BY YOUR BAND, to discuss my love of RUSH. It's a great show and you can listen to my episode HERE! 3. I'll be doing comedy and playing SMASH BROS 64 at A NEW PLAYER HAS ENTERED THE SHOW, this Sunday (6/24) at Under The Gun Theater. 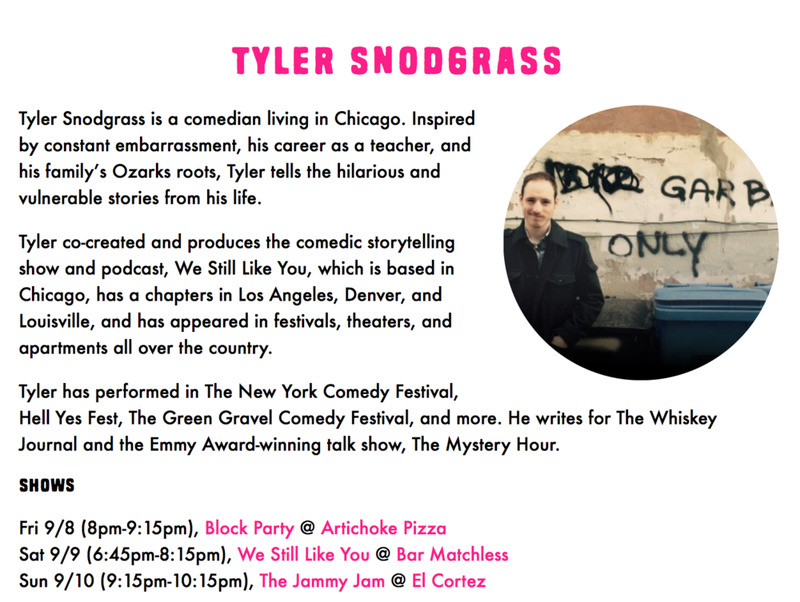 I'll be debating the great Grace Thomas in the name of comedy at ARGUMENTS & GRIEVANCES on 6/30 at At North. 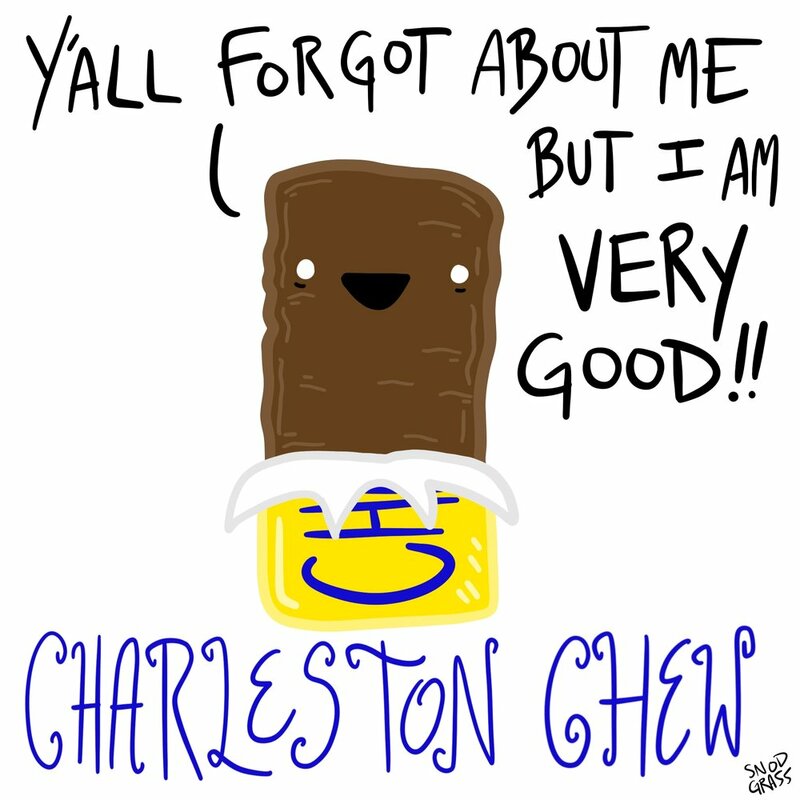 And I'll be hosting WE STILL LIKE YOU on 7/7 at The Flat Iron Arts Building. 4. 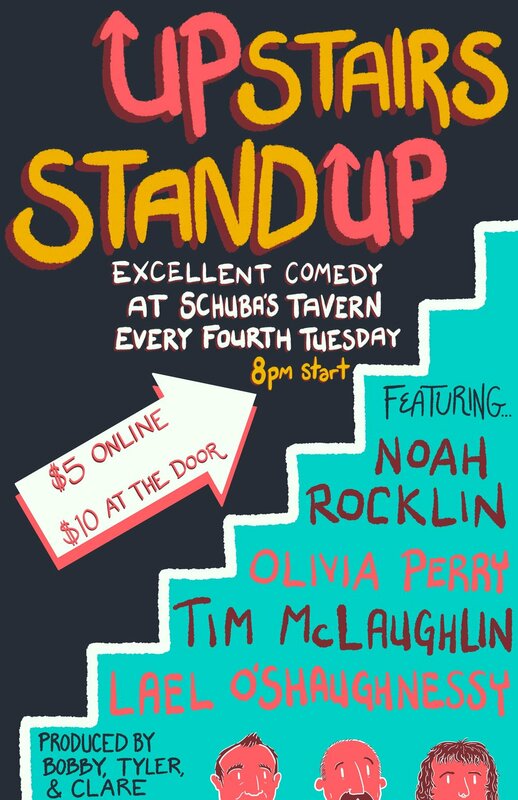 The second ever UPSTAIRS STANDUP at Schubas Tavern is happening this Tuesday! Gonna be a great show and once again we've booked some of our favorites from the Schubas Open Mic! Check out my new show: Upstairs Stand Up! Along with my open mic co-hosts, Clare and Bobby, we are producing an exciting new standup show at Schubas Tavern, one of the best venues for comedy or music in all of Chicago! Our first show is Tuesday 5/22, and all shows are on the 4th Tuesday of the month! $5 tickets are online, or you can pay $10 at the door. We're very excited to bring you some of our favorite comics from Chicago and LA, and hope you can make it to this show! In the meantime, please listen to the We Still Like You podcast (available on iTunes and Stitcher and Youtube). It's free and funny and will make you squirm with worry and laughter! 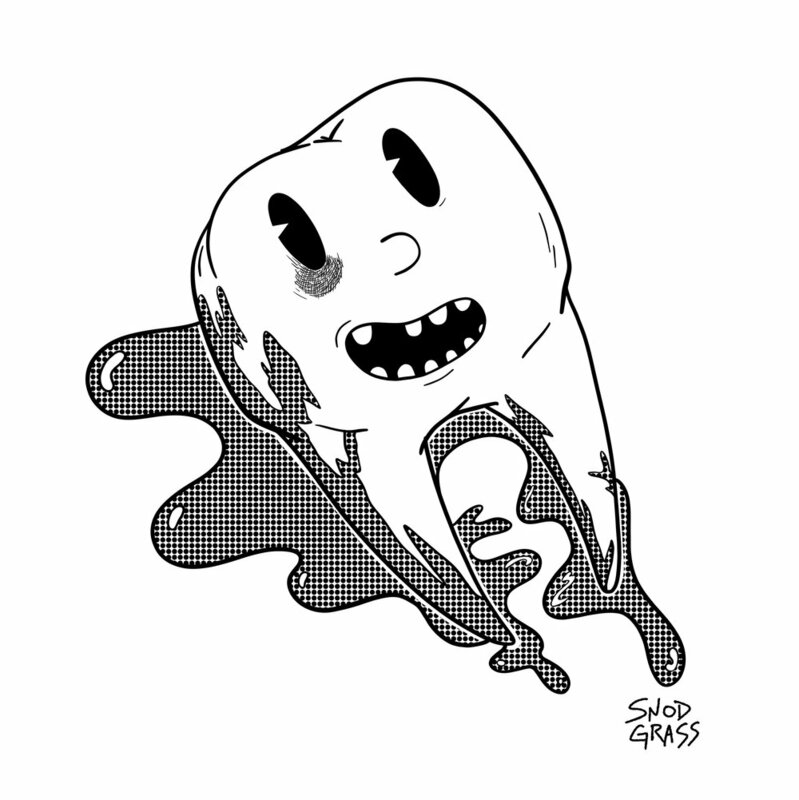 Also, I am working on some new pieces to make prints of, and if you'd like a print of something on my DRAWINGS page, email me at snodgrasscomic@gmail.com! And as almost-always, I am currently accepting commissions too! Hey! Sorry for the lack of updates! I've been a little swamped throughout March, but April and May shows are *mostly* up to date for right now! Though, you can be on the lookout for some New York City shows in May and maybe some Missouri shows as well (if I can pull it off). For booking, commissions, or inquiries, please contact me at SnodgrassComic@gmail.com. Thanks and hopefully I'll see you at some shows! Hey! This Friday (2/9/18) I'll be doing a special one-time set at The Flatiron Arts Building's Storefront Theater. 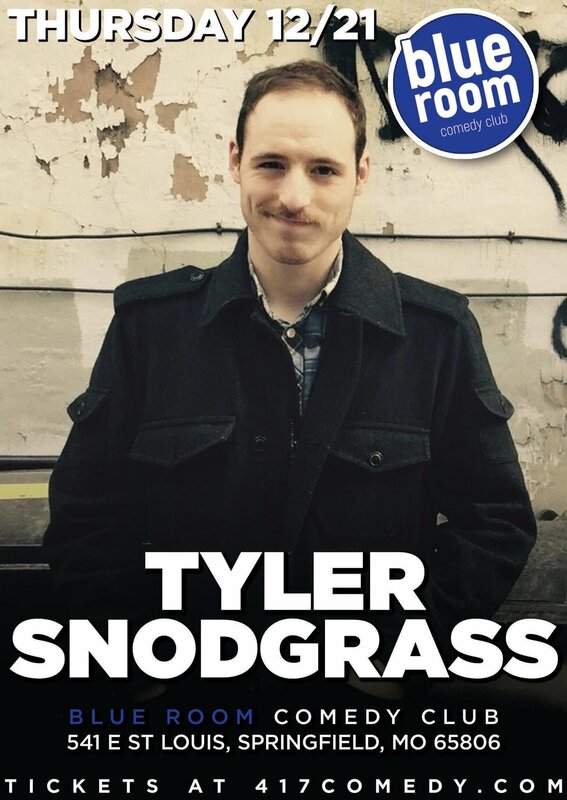 The special is called Tyler Snodgrass: RUST IN PEACE, and even though the show is going to be HALF STANDUP//HALF BANJO, it's very much influenced by my formative years as a teenage metalhead in the Ozarks. Also featuring sets from: Alex Kumin, Naomi Spungen, and host Nicky Martin. 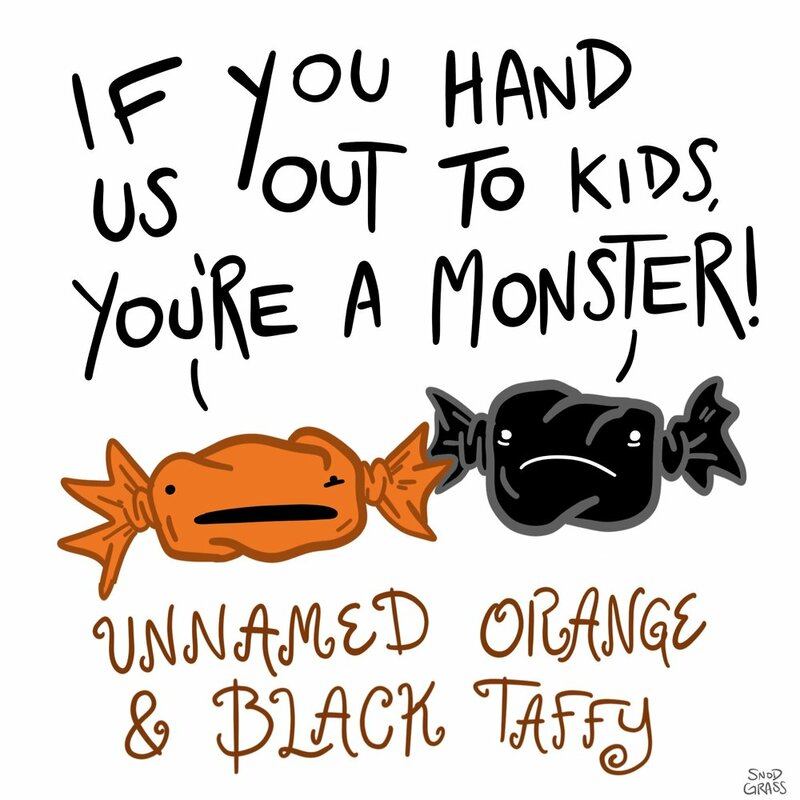 I recently wrote a piece on Medium in which I imagine what candy would say if it were telling the absolute truth about itself. You can read it here, or see all the drawings below! For inquiries about hiring Tyler for illustrations, flyers, etc, email snodgrasscomic@gmail.com. Tyler on Keith and The Girl Podcast Tomorrow! Hey there! 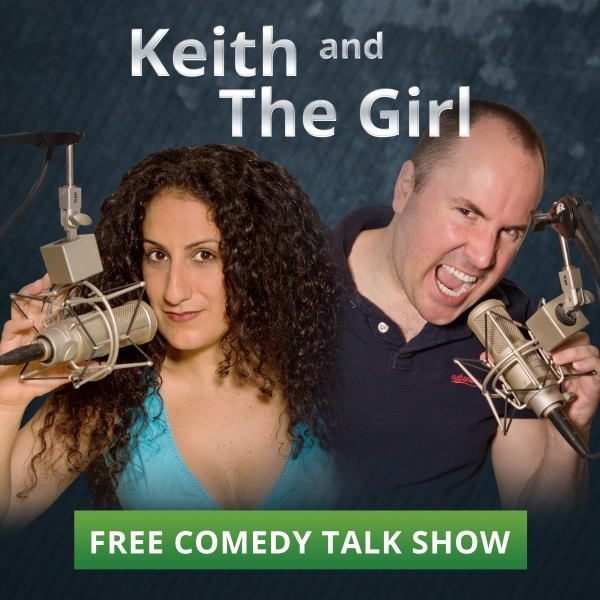 I'll be on the great interview podcast Keith and The Girl today at 5pm (Eastern Time). Go to KATG.com to give it a listen! 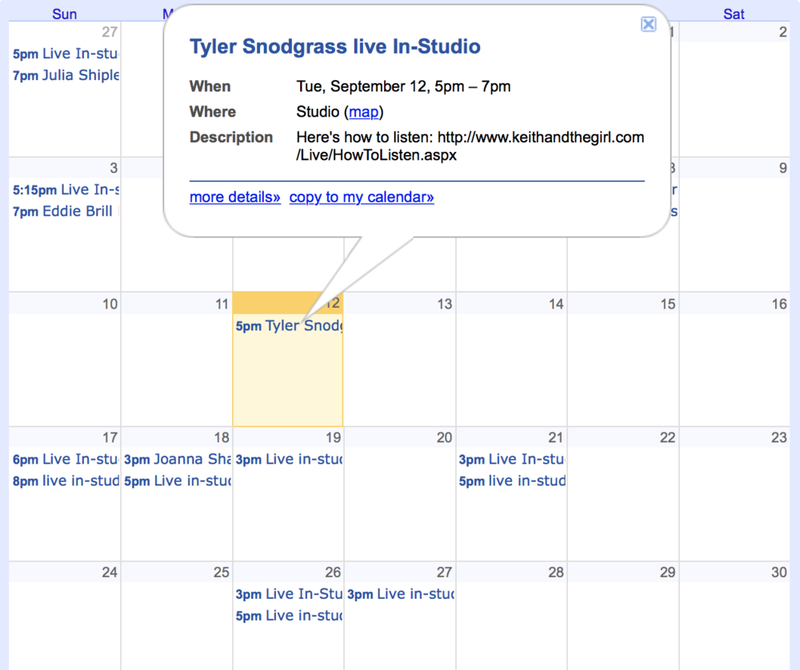 Come see Tyler do shows in NYC! Check out my new informative essay, HOW TO DRAW REPUBLICANS right here: HOW TO DRAW REPUBLICANS BY TYLER SNODGRASS. It will explain in detail how to best capture the look and essence of our nation's top Republicans for when you decide to cartoon them. Also, it features some of my political cartoons, which you can find on my Facebook page.